It's fair to say that "Barbie Dreams" was the song that took all the headlines from Nicki Minaj's new album Queen. ICYMI, it's the one where she runs through a list of rap's biggest names (Drake, Eminem, 50 Cent, DJ Khaled) and playfully takes shots at them all. 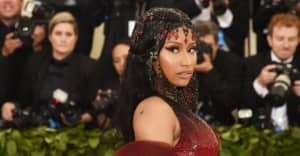 Minaj appeared on The Late Show on Monday night and host Stephen Colbert flagged up the fact that he was not included among the list of men on the song. Not wanting him to feel left out, she came up with an off-the-cuff verse for him and his "magical glow." Minaj also confirmed that two of the men mentioned on "Queen" have got in touch about the lyrics and neither of them were very happy about it. Sadly, she didn't name names other than to say Drake wasn't one of them. Check out the full interview above or skip to the 1:50 mark for her rap.